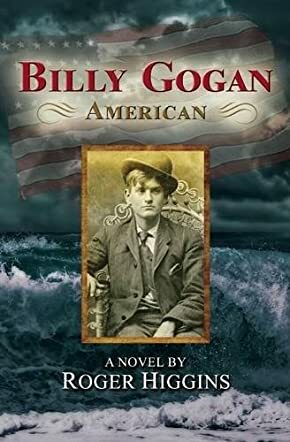 Billy Gogan, American by Roger Higgins is the fictional tale of a young man's transition from a life in Ireland to his settlement in the United States. It begins with Gogan's Irish backstory at the onset of the country's potato famine, where Billy is prompted to leave under multifarious circumstances. The passage is brutal but he survives (whereas his companion Father O’Muirhily does not) with the friendship of Maire and Fiona. All three make it to New York but only Billy emerges unscathed in New York's Five Points, where Maire and Fiona have seemingly vanished into thin, polluted air. A search ensues and continues as Billy settles in, learns the ropes, finds love, and grows as he crosses paths with some of the Five Points' and Higgins' most fascinating, duplicitous characters. Maire and Fiona resurface, but the brutality of mid-19th century New York and the seemingly omniscient “man in black” continue to haunt Billy and those he loves at nearly every turn. Billy Gogan, American is a truly ambitious undertaking by Roger Higgins. At times reading as closely to a memoir as it does to a work of fiction, Higgins brings a cast of characters and settings to life with an authenticity that is every history lover's dream. The undertaking could not have been easy, with dialogue that is accented with the same purity imparted in Higgins' detailed scenes. Billy's story is layered and interesting even when the writing (on occasion, but it's rare) lapses into substance over style. This is not a light read but it most certainly is a worthy one, and I'm comfortable recommending it to those who love a good adventure with a deserving protagonist, as well as to readers who get excited over meticulous detail and classic storytelling.